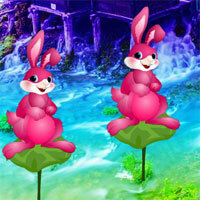 Easter Weekend Forest Escape is another new point and click live escape game from games2rule In this game, you came to celebrate the Easter Weekend holidays in a forest which is located outer of the city. But unfortunately, you missed the way out. You have to find the way to escape from there by finding useful objects, hints and solving puzzle. Click on the objects to interact with them and solve puzzles. Good Luck Have Fun! Olga, do you need a spoiler? Hotz = Hero of the day! https://imgur.com/WmTDvj7 Is correct too, but doesn't work. Game not working right, can't back out of rabbit/key in nose shot. Lovely and a little challenging except for the 170 math puzzle which was tedious and no fun. Gave you 4 stars instead of the usual 5. I can't find the blue paintbrush... any hints? I totally missed the knife in the stream.